20 | TH E M R EP O RT FEATURE interests," says the mother of three boys. "I truly admire the fact that they're able to make it work and be hugely successful across all facets of their lives. My family and friends might say something similar about my life, that I have a lot of balls in the air at once, but I somehow manage to make it all work." Pam Codispoti, President of Chase Branded Cards, calls Bonitatibus not just an innova - tor, but also a "force of nature." Lesley Corydon, Chase's Executive Director of Servicing and Correspondent Marketing, relates a story about when she assumed the CMO position in December. Bonitatibus made it her first prior - ity to travel to Columbus, Ohio, to meet the marketing team. When childcare for her sons fell through, she flew them out with her. "Any other working mom would have cancelled that trip," Corydon says, "but Amy knew how excited the marketing team was to interact with her and didn't want to let them down. The Columbus team has flourished under her leadership in large part due to her presence and genuine efforts to get to know each and every person." Bonitatibus calls herself a creature of habit—"consistently consistent." She married her high school sweetheart, Ryan Crowley, who also works for Chase. With the de - manding jobs and travel schedules, she and her husband rely heavily on family—both her brother and sister- in-law have been nannies to their boys—and that relationship-driven modus operandi certainly doesn't end when Bonitatibus goes to the office. Leveraging unique, internal relationships at Chase Mortgage to forge new ones with customers, the creature of habit creatively supports the growing habit of homeowner - ship for a new generation. Serving & Surfing the Wave M illennials may have a leg up on other generations in the tech category, but that only goes so far in the housing market. Although the largest demographic since the Baby Boomers and, in 2016, the largest group of first-time homebuyers, millennials are still the new kids on the home-buying block. According to Zillow, they are encountering a highly competi - tive market, one with 3 percent fewer homes available (year over year as of February) and values that are nearly 7 percent higher. TransUnion reported that almost a third of 18- to 34-year-old consum- ers said they hope to purchase a home in the next year, but more than 40 percent have concerns about their credit. Nevertheless, in another study, the credit-reporting company projected 13.8 million to 17.1 million first-time homebuyers entering the housing market in the next five years, with Millennials likely to make up the majority. TransUnion also added that more than 20 percent of first-time home - buyers open additional accounts with their mortgage lender. Acknowledging that a subset of millennials may reject "traditional values and choose to make differ- ent life and purchase decisions," Robyn Mahoney, director of strate- gic marketing for Wipro Gallagher Solutions, echoes Bonitatibus's sentiments: many want what older generations want, but found them- selves behind the financial eight ball with a rough job market and much tighter lending requirements. "We are definitely seeing a flood of Gen Y homebuyers entering the market today and part of that re- flects job security and confidence," Mahoney says. "Now, it is a matter of tapping into their desires and finding creative ways to help them live their values." It's nice to have a familiar face, so to speak, to turn to during the critical and sometimes daunting process of becoming a homeowner. Even better is a financial partner with economies of scale and pro - fessionals literally thinking outside of the box. Chase Mortgage's marketing program has certainly achieved a higher profile and ener- gy level with its new promotional and educational partnership with the "Property Brothers," aka Drew and Jonathan Scott, the hosts of the HGTV show now in its sixth season. Bonitatibus called the con- nection organic as the TV brothers were already Chase customers. "As we committed to the cur- rent 'Two Halves Make a Home' campaign featuring the 'Property Brothers,' Amy immediately made the most of connecting the com- munications and marketing teams," says Nancy Demuch, Executive Director of Mortgage Brand and Advertising at Chase. "The result is a bit of a 1+1 = 3. Amy has strong relationships across all lines of business. People respect her opin- ion and ability to get stuff done." 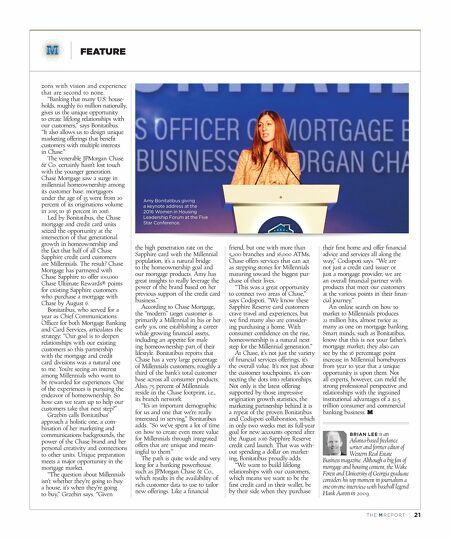 "A customer of her work," Sean Grzebin, managing director and head of Consumer Mortgage Originations at Chase, remarks about how Bonitatibus demonstrat - ed an impressive level of engage- ment and ownership for one new to the CMO position. Fun and perhaps a little flashy, yes, but the real key is that the 'Two Halves Make a Home' campaign drives value for multiple Chase channels: the branch business, the consumer direct line and home equity. "The energy by which she engaged on it, the actual hands- on approach to the initial creative concept and then the final output, it was really pretty awesome," Grzebin says. "None of the initia - tives from the past few years focused as much on aligning to our business objectives, and the actual campaigns, I think, are just right on." According to WatersTechnology, financial industry leaders viewed centralization of data as the most important issue to address last year. 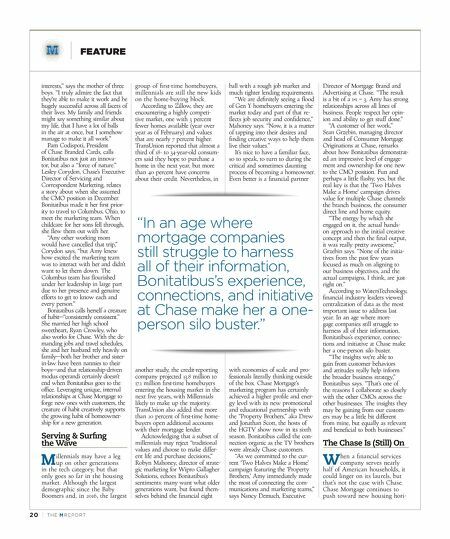 In an age where mort - gage companies still struggle to harness all of their information, Bonitatibus's experience, connec- tions and initiative at Chase make her a one-person silo buster. "The insights we're able to gain from customer behaviors and attitudes really help inform the broader business strategy," Bonitatibus says. "That's one of the reasons I collaborate so closely with the other CMOs across the other businesses. The insights they may be gaining from our custom - ers may be a little bit different from mine, but equally as relevant and beneficial to both businesses." The Chase Is (Still) On W hen a financial services company serves nearly half of American households, it could linger on its laurels, but that's not the case with Chase. Chase Mortgage continues to push toward new housing hori - "In an age where mortgage companies still struggle to harness all of their information, Bonitatibus's experience, connections, and initiative at Chase make her a one- person silo buster."